Das Ferienhaus Baan Asan liegt in einer der ruhigsten und exklusivsten Gegenden Koh Samuis - am Strand von Taling Ngam. Es ist ein einzigartiges Ferienhaus mit einer Mischung aus moderner Architektur und authentischem, thailändischem Design. Dies kann man besonders an den beiden Küchen, über die das Ferienhaus verfügt, erkennen. Die erste Küche ist vergleichbar mit der eines Fünf-Sterne-Restaurants - modern und voll ausgestattet, ideal zum Kochen lernen. Die zweite Küche ist im thailändischen Stil erbaut und verfügt über eine professionelle und authentische Ausstattung getreu der thailändischen Kultur mit einem Lava-Grill und Zugang zu einem beeindruckenden Kräutergarten. In diesem Hauptwohnbereich gibt es eine schwebende Treppe, die Sie hinauf zur nächsten Etage mit spektakulärem Meerblick führt. Hier ist ein voll ausgestatteter Fitnessraum mit Glasfront und privatem Duschraum. Aufgrund dieses Designs, können Sie mit Blick auf die wunderschöne Umgebung trainieren. Weitere Treppenstufen führen Sie hinauf zur Suite bzw. Hauptschlafzimmer. Es gibt eine eigene Lounge sowie eine private, eingebaute Küche im westlichen Stil. Diese Suite ist der Inbegriff von Luxus mit ihrer Schwebewand, hinter der sich das breite Doppelbett in der Mitte des Raumes befindet. Hinter einer weiteren Schwebewand befindet sich ein begehbarer Kleiderschrank und ein eigenes, angrenzendes Badezimmer mit großer Wanne, zwei Waschbecken und zwei begehbaren Regenduschen. Das Ferienhaus verfügt über 4 individuelle Schlafzimmersuiten. Jede Suite befindet sich in einem privaten Pavillon mit eigener Terrasse, abgetrenntem Ankleidezimmer, gemütlichem Lounge-Bereich und eigenem, angrenzendem Badezimmer. Die Badezimmer mit ihren begehbaren Duschen, Doppelwaschbecken und luxuriösen, in den Boden eingelassenen Terrazzo-Badewannen sind besonders beeindruckend. Zwei dieser Suiten befinden sich jeweils links und rechts neben dem langen Infinity-Pool (20 Meter), der durch die Mitte des Anwesens bis hin zum Meer verläuft und neben dessen ein Whirlpool ist. Diese beiden Schlafzimmersuiten verfügen jeweils über ihr eigenes Kinderzimmer mit Etagenbetten, welches mit dem Hauptschlafzimmer verbunden ist. Wenn Sie nach einem modernen Rückzugsort der Extraklasse mit spektakulärer Ausstattung und Einrichtungen suchen, sind Sie in Baan Asan genau richtig. We were lucky enough to stay at Baan Asan for 4 nights recently and had an amazing time. We were a group of 8 adults and 2 young children and found the villa to be the perfect spot for our reunion. Baan Asan is located on the beach with a spectacular view of the islands just off the coast of Koh Samui (a MUCH prettier view here than the other side of the island). We were a large group that really enjoy spending time together so the enormous living and dining areas were well used - also the pool was the perfect spot to chill out during they day. The little pavilion at the front of the property by the water was the perfect reading spot during the hot afternoon, catching the breeze from the ocean, and the perfect spot for pre dinner cocktails in the evening. The FOOD was the best we had on the island - and we ate at some great restaurants from 5 star to beach BBQ - and it did not compare to Baan Asans chef! We also had a large birthday dinner at the house and the staff helped us to decorate the villa with balloons and flowers, it looked beautiful. Thanks to Aer and her team for a perfect experience! From the moment of arrival until departure, we felt immediately relaxed and at home in what can only be a truly stunning and magnificent set up for the perfect break and escape. Aer and her team were ideal hosts -discrete and helpful in good measure. The food everyday evening prepared and served by the resident chef were just to die for. The best Tom Yum ever was savoured here. We will definitely be back. The house was perfect for us (three couples with 5 small kids). Had an amazing week! The manager and other staff were super kind and provided truly amazing service. The chef made great Thai and Italian food. We had such a great time we never felt the urge to go anywhere else during the week. The pool and the private beach were wonderful. The rooms are also stylishly and well kitted out. But the house is truly a great place to rent because of the staff! They were exceptional and delivered above and beyond the 'call of duty'. Baan Asan provided the perfect holiday location for us to meet great friends from Europe. In total we were three families - six adults and 5 kids, the eldest bring 4 and the youngest 3 months. The configuration of the villa is perfect, with separate bedroom suites where each family could have some downtime. At the same time there is a large shared living/dining area with kitchen where we enjoyed fabulous meals prepared by the amazing chef. The villa comes with four staff, managed by Pool, who is simply wonderful. She anticipated all of our needs and met them with a wonderful attitude. Each morning we would discuss the menu for that day's lunch and dinner, and then our chef would go to the markets to buy fresh produce to prepare the meals. We also hired two nannies each day to help us keep an eye on the kids, and even though we never left the villa (except for a daily beach massage! ), having some time to relax while the kids were entertained was invaluable. I really cannot recommend Baan asan more. Pool and get staff really made it for us. They are professional and kind and lovely - an absolute asset to the villa. Stay here!! You won't regret it! I was lucky enough to spend Christmas and new year at the baan asan. To say this was the most incredible holiday I've ever experienced (and I've experienced a few) is an understatement. I was lucky enough to have been with staying with 11 ( 3 kids and 8 adults) people who mean the world to me but I can honestly say the stay at the baan asan was amazing. Pooh the resort manager, couldn't have done enough for us, nothing was ever too much and you always knew you were in extremely capable hands. As for Teddy the chef , he too was happy to cook anything. The kids had more western style food, whilst the rest of us were keen to try anything. We also had an adult with a shellfish allergy which was also catered for at every meal, so top marks all round. Ann and the other fantastic gentleman ( sorry I can't remember his name) were also lovely. One minute you would be rising for breakfast and the next your room had a full makeover! 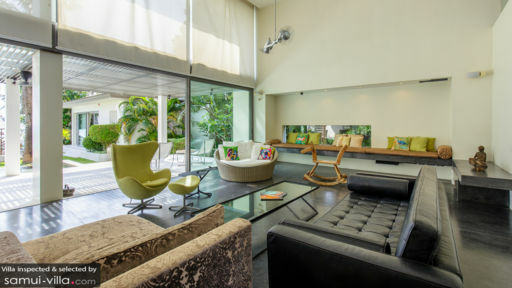 The baan asan villa is full of modern technology inside and out, with a very modern feel. I honestly can't recommend the baan asan and the staff enough. If you want to relax and take in your amazing surroundings with a very modern feel, baan asan is for you. A number of us stayed at there for 5 nights. We were warmly welcomed by the management team who immediately made us feel very at home. The rooms are very well thought through, iPhone docs (Iphone 4 only, so bring an adapter for Iphone 5!) with stunning sunken baths to soak in at night and best of all an eco friendly pool that isn't full of Chlorine!! (apparently they use some kind of cutting edge on site filtration system, installed last year) Khun Phuu, the resort manager, is incredibly intuitive, discreet and will go the extra mile for you (even when we needed to be picked up at an ungodly hour late one night!) As for Chef, he can make great Japanese, western and of course some beautifully light, yet zingy Thai dishes that have all the depth of flavours REAL Thai food should have. The location also feels very secluded and private, in that there's no noise from outside as it's located well away from the main road, right on the beach. So do stay there, we'll be back for sure, not just for the location, but the food and the wonderful warm staff, who handled the kids just right too! Our stay at Baan Asan was something really special. A beautiful location and a property with real style and comfort. The staff were so kind and prepared delicious dishes for us. Can't wait for the next time. A perfect place for a holiday with friends and family. I have just returned from another fabulous stay at Baan Asan. I have previously holidayed there with friends, and this time with family who were visiting from Europe. 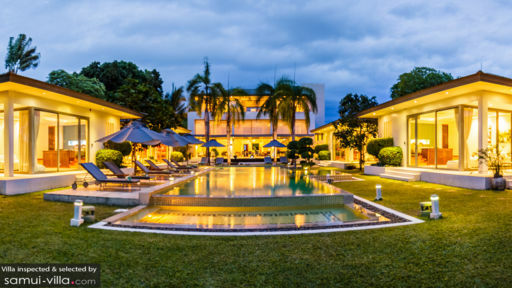 The accommodation at Baan Asan is truly of the highest quality. The design is modern and innovative, making use of the best technology to maximise comfort and convenience; and using the finest architectural design to make the most of the stunning ocean views. But what really sets Baan Asan apart is the impeccable service provided by manager Khun Poo and her team. No request was too small and the meals prepared freshly each day by the on site chef compete easily with the best fine dining available on the island. Add to this the facilities on offer (gym, pool, kayaks etc) and there really is no finer place to spend your holiday on Samui. 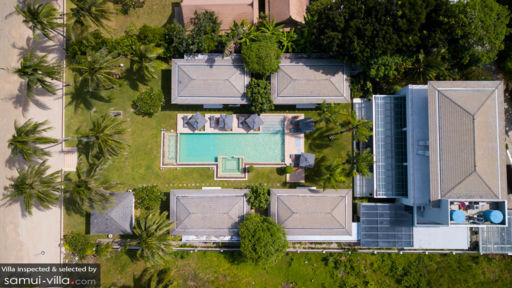 The layout of the property makes it ideal for a gathering of family or friends where you can relax and interact together, as well as having the privacy of the individual villas when needed. I highly recommend Baan Asan and will be back there again before too long! We spent several times a few nights in Baan Asan and I’m sure we’ll visit it again soon! The guests have each their private villa looking straight at the sunset, with total privacy. Not only the villas but also the main house is modern with warm details. The staff is lovely and the food options are perfect and vary. This place is for us an oasis of relaxation combined with the luxury we love to enjoy on holidays. Beginning of April we celebrated my 50th birthday and the staff organized a perfect dinner on the beach in a perfect setting. They even decorated the scene with wonderful flowers. The food prepared by the chef was outstanding. To celebrate a 50th birthday in such environment does not make you feel older, but makes you understand that life is beautiful. We not only enjoyed the big pool and the private beach, but played Golf on the excellent Santiburi Golf Course, just 20 minutes from Baan Asan. We used several times the kayaks to explore the coastline. Ask the staff to arrange a Thai massage in the Salah… heaven! My wife and I recently got married at Baan Asan and this place is absolutely amazing. We had a weeks stay with the family and I cannot recommend this place enough. The house, the grounds, the beach and the staff were brilliant. Architecturally impeccable the villa is truly one of the picks of the Island. You can tell a lot of thought went into the design you'd feel like the ultimate millionaire (even if you are not). Amazing sunset which dissects the perfectly placed palm trees at the end of the garden makes sitting in the pool even more special at dusk.. Copyright © 2019 Samui-Villa.com. Rufen Sie uns an in Thailand + 66 60 003 5911 / Australien 1300 014 384 oder + 61 2 9191 7419 / Singapur + 65 6871 8993.